Surprisingly quickly it was time to grab our gear and start our trip to Dubai. We left Phoenix around 9:00 am Wednesday and arrived in Dubai about 6 pm Thursday after a brief stop in Washington, DC. We had considered going to the Gregory Heisler exhibition at GPP’s studio, but by the time we got checked in to the hotel it was late enough that we decided to walk to the convention hall both to stretch out legs and make sure we knew where we needed to go. In the process we found the food court and grabbed a quick dinner. That being enough excitement for the evening we retired to the hotel. 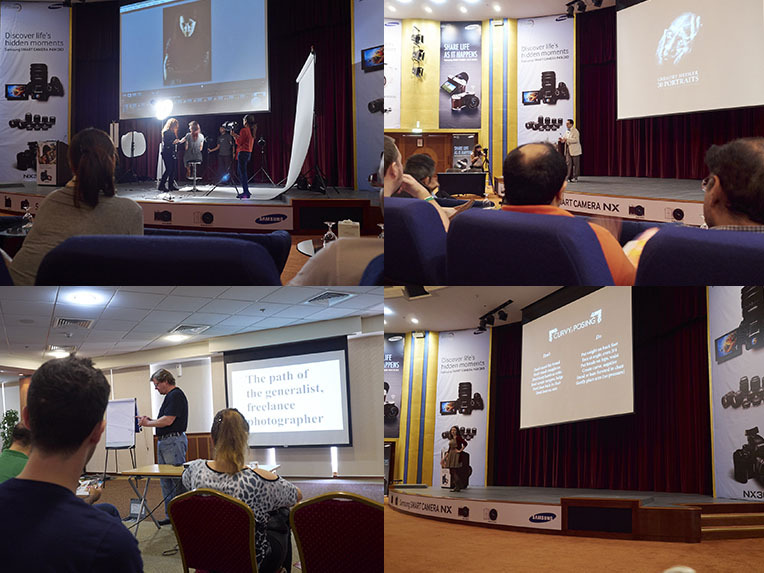 Gulf Photo Plus officially opens with Photo Friday – a day of short seminars by the instructors. Set up in four blocks of an hour an a half each it provides an easy start for the weeks activities, and the opportunity to hear four instructors of your choice. My selections started with Bobbi Lane’s “Fabulous Faces in Five Steps” where she demonstrated and discussed a workflow from concept through execution for a portrait session. This included tips on lighting set up and avoiding common problem areas. Even though this was a short session, Bobbi covered a surprising amount of material. I was glad I came prepared to take notes. Session two was “Illuminating People” by Gregory Heisler. This was not a technique session, but rather some of the stories behind several of his famous and favorite images. He discussed the stories behind several of the portraits featured in his “50 Portraits” as well as his philosophy of lighting. Seeing how he made artificial lighting look like it belonged in the picture was fascinating. The man has an incredible eye for detail. After a lunch break we went to Joe McNally’s “A life behind the lens.” Joe is probably my all time favorite photographer. It amazes me how he’s worked so long and hard yet you can still see the joy of capturing a picture in him. His talk covered everything from his early flash work through stories he’s done, and most interesting to me stories he refused to do. Finally we wrapped up with Linday Adler’s “How to Flatter Anyone, Really, Anyone.” which was another practical session for portrait photography. Lindsay started with basics of lens choice, angles, lighting, poses. hair & make up, clothing and retouching and proceeded to go into detail, providing samples of problem areas and how best to deal with them. This was another seminar that I left with pages of useful notes. Photo Friday was not only fun and informative, it gave me a chance to hear some of the photographers whose workshops I would not be taking this year. Next up – The workshops begin! This entry was posted in Workshops and tagged Dubai, GPP 2014 on March 21, 2014 by Phil Ryan.